It is difficult to read this piece of the Christmas story and not picture three youngsters wearing Sunday School Pageant finery and sporting ill fitting crowns, making their way down the center aisle while the congregation sings, "We Three Kings." And yet, my imagination is taking me in a different direction this year as I consider the story before us now. Oh, yes, there is the truth that the gifts these royal travelers presented appear to point to death for this newborn baby. And yes, there is the wonder that all the world was coming to kneel at his feet. Still, I find myself wondering about these travelers themselves and what compelled them to take such a journey in the first place. And so it is that I find myself returning to the poem by T.S. Eliot, "Journey of the Magi." 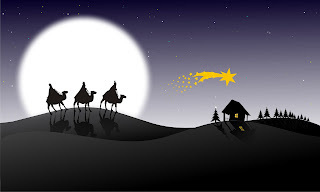 (If you want to hear it read by the poet, go to this link: Journey of the Magi.) For what a journey it must have been for those who first followed that star. Indeed, Eliot imagines it as difficult all the way through from beginning to end and his poem asserts that the challenges did not cease for them once they returned home. And how could it have been simple after that? For they had, no doubt, risked their fortunes and their reputations to travel far --- only to have their purposes nearly thwarted and their lives threatened by a paranoid ruler. For they had traveled to see royalty and they were led to kneel before a baby born of poor parents in an out of the way place. They must have had dreams and nightmares both about this particular journey for the rest of their lives as they wondered at its meaning for them and for all the world. And so find myself thinking of those wise men, those magi, those kings and I find myself wondering about what stirred in their hearts to compel them to risk so much. What deep yearning for something other than what they had known led them to travel so far? And as I think of them I find myself thinking of all of us and wondering at other journeys taken...and what it is that makes such journeys possible, necessary, preferable, even, to simply living the life that is right before us. What sign in the sky, what communication from God, would make me go that deep, that far to discover its meaning for me? And then it strikes me that those travelers to Bethlehem were simply living their lives to their natural conclusions. For apparently their life's work was studying the stars. And when they saw a star which seemed to hold such meaning, all they could do, if they were to be true to who they were called to be, was to follow its direction. So having studied the stars and having felt the prodding of one particular star to take this incredible journey, when they came to the place to which the star led them, they were met there by God. We know this could not have been at all what they expected --- at least not God in the form and circumstance before them there. And it may well have been true, as in T.S. Eliot's estimation, that things were never quite the same again for them --- and perhaps in ways that were not all that pleasant. Still, in that baby, they met the 'Holy One,' God's Own Son. And all they were doing was what they believed they were made to do. And yet, at the same time, this was probably more than what they bargained for when they first started out --- for packing up to travel to far flung places was probably not in the job descriptions they first accepted. Indeed, in what they set out on here and in what they experienced in and through this journey, there was a whole lot more for them now than sitting in a quiet, familiar place, taking notes on parchment and sharing their insights with others. us... as we become all we were made to be, with eyes and hearts open, perhaps we, too, will encounter God there as well. And yet, there must be a point, it seems when we follow God's leading out of our most comfortable places in order that we might encounter the Holy One as well. And it could be that it might not look like we thought it would, but in the surprise itself, perhaps God resides. And so for those who teach, and those who preach, and those who visit, and those who build, and those who nurture children, and those who clean, and those who invent and those who heal and those who....well, you fill in the blank. Maybe like those magi from so long ago, our first calling is simply to be who we were made to be. And then to keep our eyes and ears and hearts open to when we are called to step out in faith, somehow taking those gifts of God to their natural conclusions. Oh, those times will come to us all, that's guaranteed. And when they do, and when we follow God's leading within and beyond them, it is also a sure thing that we will encounter God, perhaps in unexpected ways and places, too. And it is also certain that our lives will never be the same again. Put yourself in the place of the travelers in the story here. What must have been their thoughts, their hopes, their fears as they began this incredible journey? As they ended it? Have you ever known yourself called on such a pilgrimage? What was its outcome? How were you changed? 2 options for another perspective: Operetta by Gian Carlo Menotti, "Amahl and the Night Visitors," tells the story of the Magi stopping along their journey and spending some time with ordinary folks they need to explain things to. I was very intrigued when I saw it at a very young age. Also, when older, read "The Other Wise Man" by Henry VanDyke. Rude awakening...WE are capable of being the other wise man. Yes, he missed the big event, BUT he did exactly what Jesus wants us to do. Great yet different stories.